EXFOLIATE! EXFOLIATE! 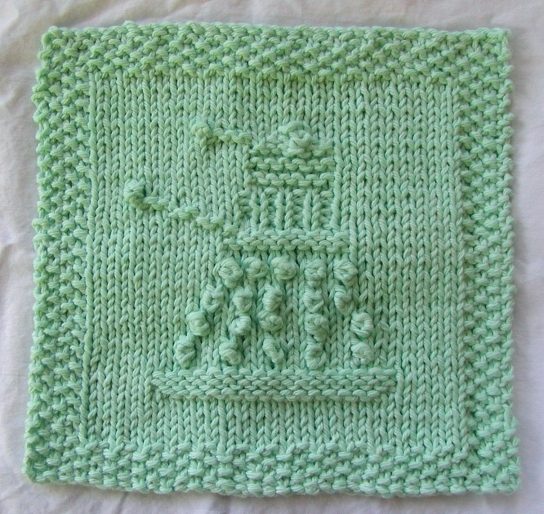 with this Dalek-patterned knitted washcloth. It works just as well to exterminate dirty dishes. Sew the squares together to make bags, quilts, etc. Or just use the central pattern to ornament a sweater or other knitted item. A fast, fun knit for any Doctor who fan! Rsb – right-side bobble. Into the stitch marked, knit purl knit purl knit, making 5 stitches into that one stitch. With the left needle, pick up the stitch that is furthest from the tip of the right needle and pull it over the other four stitches and off the needle. Repeat with the remaining stitches, pulling the furthest-away stitches over the other stitches and off the needle, until four stitches have been pulled off and one stitch remains on the needle. Your bobble has been made! Wsb – wrong-side bobble. Sometime a bobble is needed on a row you are working from the wrong side. To make the bobble appear correctly, the bobble needs to be reversed from the right side bobble. On the stitch marked, purl knit purl knit purl into the stitch, making five stitches into that one stitch. With the left needle, pick up the stitch that is furthest from the tip of the right needle and pull it over the other four stitches and off the needle. Repeat with the remaining stitches, pulling the furthest-away stitches over the other stitches and off the needle, until four stitches have been pulled off and one stitch remains on the needle. Bobble made! Srsb – small-right side bobble. Made exactly like the rsb, but with three stitches instead of five. Into the stitch marked, knit purl knit, making three stitches into that one stitch. With the left needle, pick up the stitch that is furthest from the tip of the right needle and pull it over the other two stitches and off the needle. Repeat with the next furthest away stitch, leaving one stitch on the needle. Bobble made! If you have questions about the pattern, feel free to ask and I will try to answer. If your question is related to basic knitting problems as opposed to this pattern specifically, I would recommend trying your library for knitting instruction books or using a website such as KnittingHelp.com.